What is the key to a successful working relationship, as a chamber group? "Pizza," said violist Patrick Marsh, 17, without hesitation. Marsh is a member of the Los Angeles-based Clemens Quartet, which appears this week on the acclaimed radio show, From the Top. "Order two boxes, and..."
"...everyone just flocks," finished first violinist KJ McDonald, 17. "If you bring pizza to every rehearsal, then we all have an incentive to come," continued second violinist Jason Corbin, 16. "We meet once a week, usually at 5:30, and we spend a half-hour eating, and talking and relaxing a little bit," explained cellist Alex Mansour, 17. "Then usually we rehearse for about an hour. We'll rehearse whatever repertoire is most pressing -- if we have something to work toward, or a competition, or if we have a performance opportunity, we'll work on that repertoire, as well as sight-reading other pieces." In conversation or in performance, this group of young men communicates with an easy rapport, finishing each other's sentences and phrases to make the meaning complete. I had seen them perform once before, and I spoke with them a few weeks ago, between their trip to Connecticut to perform on "From the Top" and the date when it was to be aired. (Today online, and throughout the week on various NPR stations.) Their performance features the (modern and ear-bending) first-movement "Allegro" from String Quartet No. 4, Béla Bartók. (You can click here to view the show online.) For the uninitiated, "From the Top" is an hourlong show hosted by pianist Christopher O’Riley that is broadcast on 250 stations across the U.S. to an audience of more than 700,000 listeners. Each show features five acts, all young musicians, with performances, interviews, sketches and games. They tape about 20 episodes per season in front of a live audience, at various locations across the country. 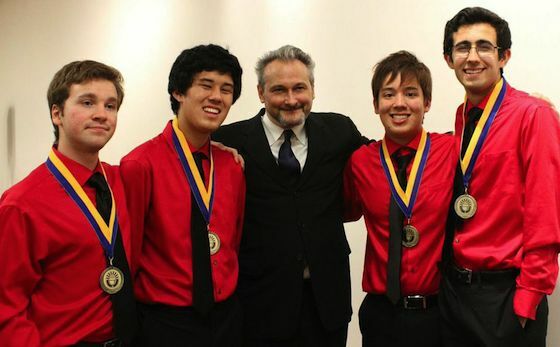 As for the Clemens Quartet, the group came together two years ago, assembled by the private teacher of both violinists and the violist, California Institute of the Arts (CalArts) violin instructor Lorenz Gamma, and coached through the program Junior Chamber Music. Some members had been playing together before they officially became the quartet they are today, and for a while they just called themselves the "Hangout Quartet" -- named by one of their moms for their part-rehearsal, part-pizza get-togethers. But this is not to say that they don't take their musical endeavors seriously. It's just that, along with all the rehearsing, practicing, coaching and traveling to competitions, they find music to be fun, and they enjoy each other's company. "Especially in quartet music, you need to have a certain friendship going on," KJ said. You also have to trust each other and to be able to take turns in the spotlight, as quartet music demands. 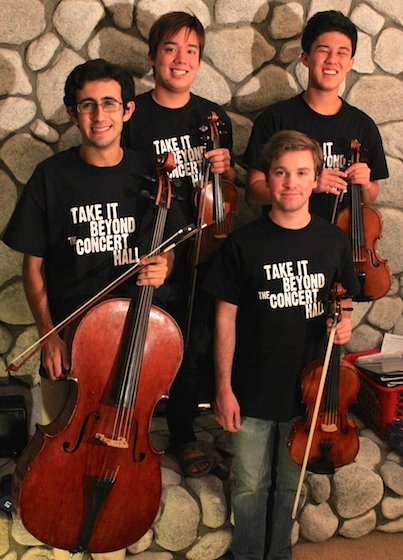 When they entered the Fischoff National Chamber Music Competition this fall, they decided to go with a different name. "We needed a more official name than the 'Hangout Quartet,'" Patrick said, and Jason continued, "a more professional name, a name you would actually bring to a concert." The first piece that they played together as a quartet was Dvorák's String Quartet No. 12 in F major, Op. 96 "American." "That kind of reminded me of Huckleberry Finn, on the raft, going down the Mississippi River and having a lot of fun," KJ said, and that gave him an idea: "Samuel Clemens -- that would be Mark Twain's real name." Thus they became the Clemens Quartet. To audition for From the Top, the quartet had to record two pieces and to write essays about arts leadership and about their group. They chose to write statements about one another. Once selected for the show, the quartet traveled to Storrs, Connecticut, to record it, with "From the Top" paying for most of their related expenses. Their moms went with them, as did their teacher. "It was a very detailed program that awaited us when we got there," said Lorenz Gamma, their teacher. "It gave them the freedom to concentrate on their music-making." The program included not just the performance, but also outreach concerts and a workshop on arts leadership. On their first day, they performed outreach concerts at two schools, with a rehearsal in the morning. Their first school was a rather bustling middle school, on Halloween morning. "The PA kept going on, with the parents dropping off costumes," Alex said. "But some of them, I think, got a lot out of it." Then they went to a music school, where the performance was more of an exchange, with kids from the school also performing. For those concerts they played excerpts from the Bartók quartet and also, "Viva la Vida" by Coldplay. The second day was devoted entirely to the show itself. For their performances they like to all wear red shirts, with black ties. "It's fiery..." Jason said, "...and it kind of matches our personality," KJ said. "We've actually been criticized for being too energetic," Alex said. "We do try to work on that, but everything we do is really passionate, there's a lot of adrenaline. I think red is a good color to communicate that. It makes a statement, certainly." And why do they all wear the same thing? "When you're in a quartet, you need to conform to one mind, one sound," KJ said. "It's not like four sounds, playing four different solo parts, that happen to be together." For the From the Top performance, "there was a rehearsal in the afternoon, where they do the sound check, they mike you," Alex said. "They record you playing it (for the rehearsal), and they try to get a perfect take. Then they ask you to do sections again where you may have messed up, so what they ultimately air, they can splice and make it as polished as it can be." The pre-recording is just a little insurance against the possibility that an audience member has a major coughing fit during the performance, or perhaps a fire truck roars through the room with engines blaring during the live performance. But it's also a great comfort to the performers, freeing them up for some spontaneity. "For the most part, they want to air what we played live," KJ said. "But that way, we have the comfort of saying, okay, if we make one mistake..."
"...they have a Plan B," Alex said. "But that didn't stop the adrenaline" for the live performance, KJ said. "I think part of us thought, why not have a lot of fun with it? We already have it in the bag, worse case scenario, we might as well take risks and make it very exciting and really get into it, rather than playing it safe to make sure that we don't make a mistake," Alex said. "You can see for yourself, but it was pretty fast!" Jason said. On the day after the performance, they participated in an arts leadership seminar, and this seemed to be their favorite part. It gave them a chance to get to know the other young musicians who were performing: cellist Derek Louie, pianist Chelsea Guo, oboist Cassie Pilgrim, violinist Charlotte Marckx and cellist Olivia Marckx. "I felt like I made a lot of great friends, and I thought that the things they were talking about -- how we need to go out and spread music -- were very inspiring," Jason said. Jason is already involved in such efforts, as vice president of a group called Musicteers, which aims to increase interest in classical music by playing at places like malls and senior homes. Has he had any success, spreading music? He shared a favorite story: at one of those concerts, in a mall, he and KJ were playing a Korean drama song called "B Rosette" and "we inspired this one kid who had put down the violin, because he wasn't interested in it, to pick up the violin and start playing again!" The seminar allowed them to consider some new thoughts and ideas, as well. "The biggest one for me was the idea of music needing common ground," said KJ, who also studies with Itzhak Perlman for part of the year at The Perlman Music Program. That common ground doesn't necessarily have to be something simple. Though the quartet they were playing for the outreach concerts is very complex, "the more we played the Bartók for many of these kids, they were actually able to keep up with the rhythm. It wasn't just 1-2-3-4, they were able to do the syncopations and keep along, you could see them nodding their heads a little bit. So I felt like we're not giving these kids enough credit. They do have the common ground, they just don't know where to start with classical music, and I think that is what our job has to be." "Sometimes when people hear things they don't know about, they'll shut their ears," Patrick said. "But if we can communicate what it is to them, how it relates to the music they listen to and love, they'll show more appreciation for it." Patrick is a mentor at the El Sistema-inspired program called YOLA, and he works in an outreach program at his school, LA County High School for the Arts, called LACHSA on the Road. "We try as hard as we can to organize groups, to listen to different types of music and communicate what all this music is and what it means, so we can culturally extend it to people." "I think it's very profound how any art -- music, dance, visual art, cinematic arts -- can really translate across the world," said Alex, who also composes film music and is class president at his high school, Chaminade College Prep. "It's very much a universal language. Everybody understands basic human emotion and human experiences, and it's evoking that emotion and making people feel something and changing them in some way through that." Before anyone jumps to conclusions about the proclivities of these folks being due to their youth, let me just say that I'm pushing 50 and pizza is still a powerful attractant!